To understand the spiritual family we are part of, it is helpful to know about those who have gone before us—those who have shaped our identity, beliefs and values. Canadian Pentecostalism is a multidisciplinary study edited by a Pentecostal Assemblies of Canada (PAOC) credential holder who is a sociology professor at Trinity Western University. 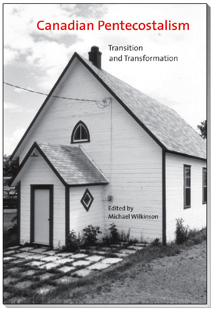 Dr. Michael Wilkinson provides a number of historical and sociological snapshots of the Canadian Pentecostal/Charismatic Movement. In doing so, this book offers many beneficial insights into the movement’s evolving identity leading to an analysis of current realities and projections of future opportunities and challenges. The book is organized around three areas: the origin and development of Canadian Pentecostalism, aspects of the Canadian Pentecostal experience, and the institutionalization and globalization of Pentecostalism. A broad range of entities within the movement are touched on including Oneness Pentecostals, Denominational Charismatics (Anglican and Roman Catholic), the “Toronto Blessing,” and international Pentecostals new to Canada. Each of these chapters expresses an appreciation for the diversity represented within the Canadian Pentecostal/charismatic family. The PAOC, as a “big brother” with a long history within the Pentecostal family, receives a great deal of study and analysis. The Canadian Pentecostal experience section deals almost exclusively with the PAOC as it focuses on the theological education dynamics of Western Bible College in Winnipeg, the development of a Lucan hermeneutic within Canada, the Native Pentecostal church in British Columbia, and a feminist exploration of ministering women within the PAOC. One may not agree with all of the various authors’ conclusions. However, some benefits of reading this study are: (1) Guenther's analysis of how Pentecostals, in their ministerial training, dealt with their aversion to institutionalization and organized theology while having a high view of Scripture; and (2) Burkinshaw's analysis of the strong role that indigenous leadership played in the early years of native ministry. Chapters that are broader in range—by Beyer, Wilkinson, Althouse, Holm and Di Giacomo—all present insight and analysis that a Pentecostal leader in Canada today should be engaging. Matters such as the distinction between U.S. and Canadian Pentecostal identity, the migration of Pentecostals leading to transnational religious networks, and localized limits to growth all have implications on a leader’s current context. A fascinating observation by Althouse is in itself worth purchasing this book. This specifically concerns the historical eschatological impulse of Canadian Pentecostals which has led to a critique of social situations and the presentation of a countercultural vision—without leading to societal transformation due to ambivalence about political activism.